Each year retail displays are readied in preparation for the gestation and labor of the catch-all holiday season before floating into a colorless postnatal celebration of mundane plenty. Capitalism’s sympathetic pregnancy makes for a cold and lifeless pas de deux, at times humorously inseparable from the vitality of social milestones. 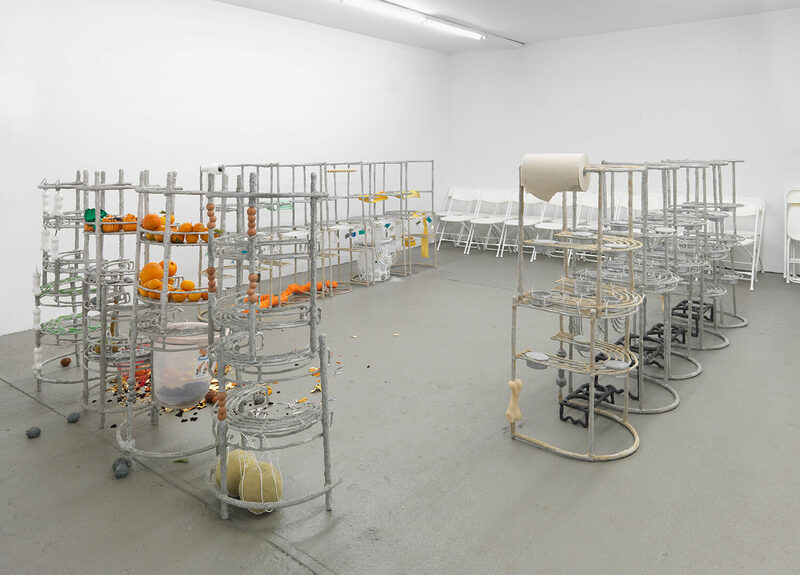 At the Swiss Institute Lupo has created an installation of bathroom storage shelves coated in Magic Smooth, an epoxy clay, and cat litter, assembled into 28 oversized human teeth, conjuring for this writer afterimages of Haim Steinbeck, Claes Oldenburg and Rachel Harrison. In an abject inversion items that are typically used in the toilette here are correlated with eating and dental hygiene. This mechanism appears regularly in the artists work, as exemplified by her inclusion of Rubbermaid’s “Ice Only” Brute Container – marketed as a food-grade product but indistinguishable from those intended for refuse. Here, what is normally a continuous dental arch is broken up into three acts (trimesters? ), each defined by the different groupings of objects that are embedded into them. The first array features a crude nursery of anticipation; accessories associated with pets such as cast aluminum dishes, dish stands, and nylon chew toys. The second array’s focal point, boutique citrus varieties, are for humans, but the evenhanded treatment of objects throughout the installation has an equalizing effect on its human and non-human constituencies a like. Inorganic materials feature in the third group, most prominently stress balls, hands-free baby bottle holders, and a dozen varieties of dental floss. While the objects used in the work remain themselves, their juxtaposition elicits complex readings, often physical and psychological double entendres. The orange stress balls are paired with artificial breasts made of the same memory foam, while real oranges — the size you might put in your top playing dress-up — reside nearby. In addition to material dialogues, language plays a prominent role in the work and an exhaustive index of the products used accompanies the press release. Across from Dura Chew Knobby Bones are cartridges of Oral-B Glide Pro-Health Clinical Protection dental floss. Go ahead, you can put them in your mouth. Nancy Lupo (b. 1983, Flagstaff, AZ) is an artist living and working in Los Angeles. Recent exhibitions include: The Third Badger, 1857, Oslo, Norway (2015); Not S.A.D., Wallspace, New York, NY (2015); Taster’s Choice – curated by Christopher Y. Lew, MOMA PS1, New York, NY (2014) and Old Zoo Food, LA. David Andrew Tasman is an artist and writer formerly trained as an architect. He has contributed to DIS, Kaleidoscope, and PIN—UP magazines, and is the co-editor of Exhibiting Architecture (Yale, 2015). He lives and works in New York.